My Bobby Dallas cocktail was originally an apple pie dessert martini. Apple pie is a great place to get inspiration for a cocktail. It's fruit and spice at its core with a bit of tang, a bit of char and a lot of sweet. This drink also draws inspiration from the dessert, but is totally different from the Bobby. I used two Apple-based spirits: the Apple-flavored brandy, Applejack, and German Berentzen Apfelkorn, an apple-flavored liqueur. For spice, I used the Italian liqueur Galliano, which is flavored with a mix of spices including vanilla, star anise, ginger, juniper and citrus (sounds like a good partner for gin, doesn't it?). Melding these together is Flor de Caña dark rum, which seemed like the appropriate base spirit, since it's distilled from sugar cane molasses. Not that I put molasses in a pie, but the burnt sugar taste seems spot on. 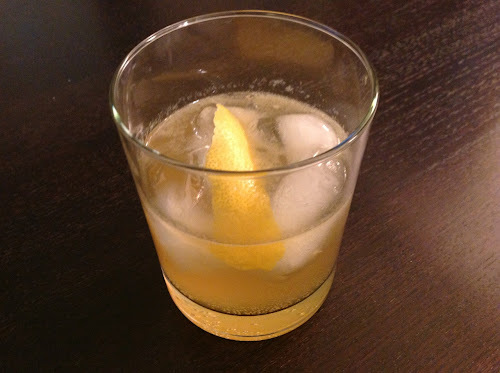 Combine rum, Applejack, apple liqueur, Galliano liqueur and lemon juice in a shaker with ice. Shake until cold. Pour into rocks glass with ice. Add ginger beer and stir to combine. Garnish with lemon peel. When did we have this and when are we having it again? I made this about a month ago. On a weekend, I think.